Interactive toy mobile phone with chunky phone button and rotating light-up screen. Features 3 different modes of play for fun role-play learning! Press the 10 light-up number buttons and 2 shape buttons on the keypad to learn numbers, colours and shapes whilst developing hand-eye co-ordination and essential motor skills. Lots of cheerful melodies, fun phrases and sound effects to keep baby entertained…. This toy costs approximately £10.99 (for the latest and best prices make sure you check our retailer list for the VTech Tiny Touch Phone above). 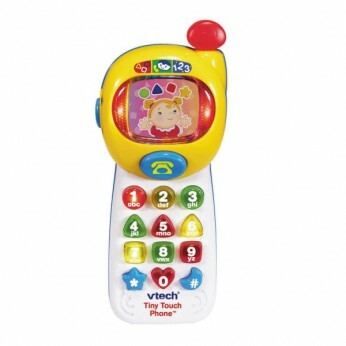 In our review of VTech Tiny Touch Phone we classed it as being suitable for ages 3 years, 4 years, 5 years but recommend you check the manufacturer specific advice before purchasing.